often can describe past lives. children and their special gifts. highly evolved children enter our world every day. and their families, rather than labeling, segregating, and condemning them. from counseling real kids in real families. 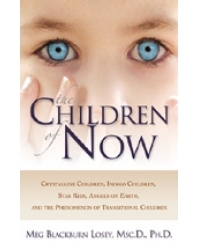 Meg Blackburn Losey, Ph.D. is the author of Conversations with the Children of Now, the international bestseller The Children of Now: Crystalline Children, Indigo Children, Star Kids, Angels on Earth and The Phenomenon of Transitional Children, Pyramids of Light: Awakening to Multi-dimensional Realities and the Online Messages. She is also a contributor to The Mystery of 2012 Anthology. Dr. Meg has an online radio show, “Continuum”, which she broadcasts from shirleymaclaine.com. She is a regular columnist in Mystic Pop Magazine and contributor to many other publications. Dr. Meg is a Keynote Speaker and lectures worldwide including trips to Sacred Sites including Scotland, England, Peru and Mexico.. She has recently served as a consultant to Good Morning America. Dr. Meg can be reached by e-mail at drmeg@spiritlite.com, or on her website at www.spiritlite.com.